Love 300? Enter to win a 300 styled Xbox 360 at engadget - GameSpotting! Posted on August 2, 2007 by MASA. 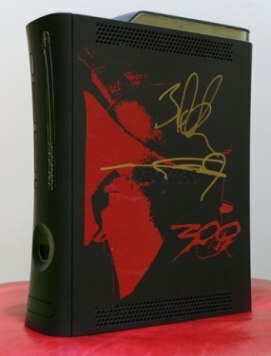 If you loved the movie 300, you can enter to win a signed 300 styled Xbox 360 and not available in any stores. You can’t buy this console and the only way to get it is to leave a comment on Engadget with your favorite scene in the movie. It’s an Xbox 360 Elite that is signed by the 300 comic creator and by the director of the movie. It also comes with the 300 HD-DVD (which we know will be obsolete when HHDDVVDBVD comes out). According to the contest rules, you can only enter once and the contest ends on August 12th. You can enter by going here.